We are bringing it back this week! 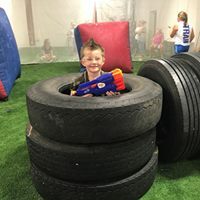 Get your nerf on and be listening for hourly chances to win a Nerf Warz Prize Pack for 2 from Wilmington’s premiere indoor foam dart battlefied, Crossfire Paintball and Nerf! The prize pack includes unlimited playing time and you will instantly qualify for a Crossfire Birthday Party for your little one and 7 friends.